Teachers explain the following to your students to help them understand the concept of significant figures and how and why they are used before continuing on to the worksheet and board work included in this science lesson plan. Science relies on measurements and calculations to prove laws and theories. These measurements and calculations often involve very large and very small numbers. The measurements also reflect the degree of measurements that the measuring tool is able to perform. Calculations can describe no more and no less than the measurements themselves. Thus, the numbers cannot be any more definitive in the calculation than they are in the measurement. For example, if you were to multiply a measurement having 2 digits times a number having 6 digits and then you would have to turn the answer into one that reflects the accuracy of the measurement. To determine how many digits should be in the answer, we look to the limiting term. The limiting term varies with the type of calculation you are performing. Demonstrate the use of significant figures in multiplication by introducing the following rule and working through the problem below with your students. When multiplying and dividing quantities, leave as many significant figures in the answer as there are in the quantity with the least number of significant figures. If you actually work this problem out, you will see that the actual answer is much longer and goes on into infinity. However, the limiting term in this equation is the 2.2, which contains 2 significant figures. Using the rule of rounding, the number to the right of the five is smaller than five and so the number remains the same and the rest of the numbers to the right are dropped. Demonstrate the use of significant figures in addition by introducing the following rule and working through the problem below with your students. When adding or subtracting quantities, leave the same number of decimal places in the answer as there are in the quantity with the least amount of significant places. When you work this problem out, you see that the answer is actually 5.57. Using the rule of rounding, we see that the seven is larger than a five. Therefore the five changes to a six. The seven is dropped because the number 2.2 determines that the amount of numbers to the right of the decimal should be one. 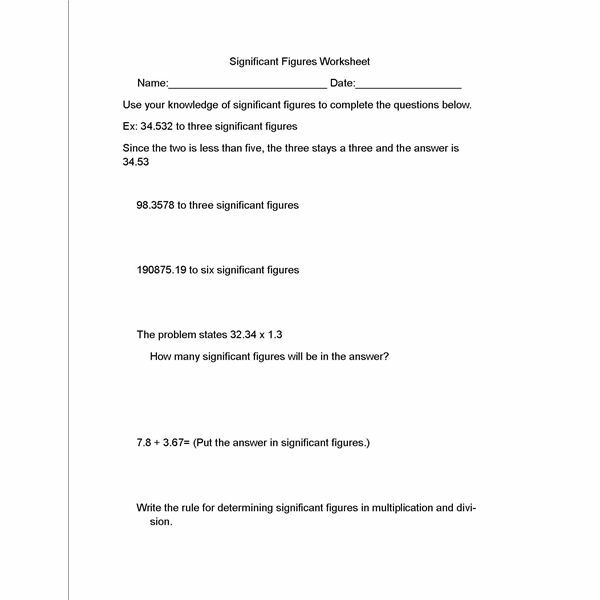 After demonstrating the use of significant figures to your students, have them do the significant figures worksheet that is included with this science lesson plan. To reinforce students’ understanding of the use of significant figures, refer them to the significant figures study guide. This study guide puts scientific terms into terms that students can easily identify with. Use the study guide as a component of the lesson plan or for students who are having difficulty understanding how to use significant figures.